A while back I told you that we were in the process of beginning the changes to our country home. It's only a small change at this point, certainly not the finished room reveal that the post title touts (but it got you here, didn't it?) I do promise to do more down the track but at the moment all spare money is being saved towards our trip to Europe which is coming up in 3 weeks and 5 days. And, argh! that is creating it's own stresses writing that here because that is really NOT LONG AT ALL. More on that another time though. So we've painted the main living area of the country house. It's a big backwards L shape and we've painted the long sides. The short sides are the kitchen and we still need to get to that. We have the paint (it's going to be the same white that the wall on the left side of the finished photo is) but the main thing we're lacking there is the time. MR is currently busy promoting the family business at the country field days around WA and I'm only there about once a month for two nights and relaxing, spending time together and socialising seem to take up all of that time! We'll get there. First undercoat of white on. We ended up with two undercoats and two topcoats. I did most of the cutting in and MR did the rolling. We were so amazed by how different it looks. Even looking at it now in the photos, I'm astounded by how much of a different vibe I get from the room. The turquoise was quite hard to photograph, it's more of the greeny colour down near the chairs than the blue up near the sun shining in through the skylights. The colour is Tempted Turquoise from British Paints if you want to see the real deal. (6th across from the bottom right of the colour panel). The white is from Dulux and is called Peplum Quarter. 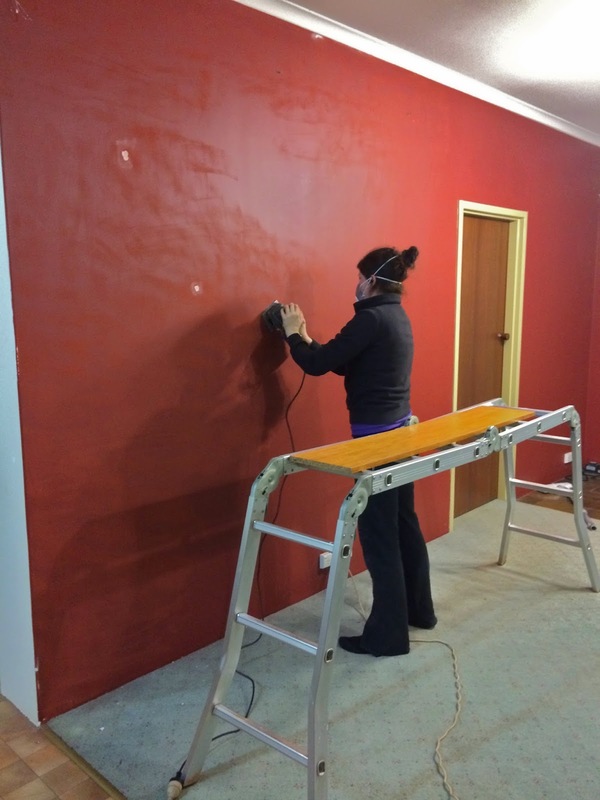 This was our first experience of painting walls ourselves (other than helping out others) so it's certainly not perfect. The paint tape didn't stick down very well (even though we bought the good blue scotch stuff) so unfortunately a bit of turquoise paint has seeped under it onto the lino floor. Any tips on how to get the tape to stick properly would be greatly appreciated experienced painters! As you can see, this house has amazing, wonderful, glorious amounts of natural light. Up above that wooden paneling is a raked ceiling with windows running the entire length of the dining and kitchen area which lets the light into the south facing side of the main living areas. MR's parents designed and built this house so they were definitely well ahead of the typical type of house built twenty odd years ago. I'm really looking forward to moving in to it, which is going to be at the end of this year! I've told my principal and put in my transfer with the Education Department last week, so it is fairly official! I think having such a beautiful home to move into is really helping my excitement levels about being back in the country away from the clothes shops and the shops with large varieties of food and the cafes and pilates. That and it will be the first time in our seven year (almost eight by the time I move) relationship that MR and I will be living together, properly. That is the part I am looking forward to the most. The blue tape shouldn't seep, you've got to press it down and make sure it's flat and stuck well before painting. Also peeling the tape off when the paint is touch dry but not completely dry helps too. I'm impressed you're the cutter-iner and MR is the roller, I'm the other way around I'm the roller I can't be trusted to cut in! Wow, that is amazing, Grand Designs amazing. I can't believe what a difference it made. I love that whole vertical row of colours!! You did such a marvellous job. It must be so exciting preparing your home for being together. Your trip is so soon! !